It’s been nearly 45 years since the death of my older sister, Alice Ward Kelly, R.N. And I thought I’d reminisce about her all too brief but meaningful life. None of my father’s eight children became a physician like him. One of us did join the “healing profession” — so he can take some satisfaction in that. Alice might have become a physician. She just never got the chance. 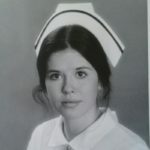 My father one confided in me that before her tragic death in 1974, Alice “was seriously considering medical school.” The calling was there, dad felt. In a show of cruel fate, Alice was on her way to the hospital during a serve Northeast storm when she crashed her car and died. Doubly cruel, Alice was the second sibling in the family to die in an auto wreck (a 1971 accident had claimed the life of our sister, Clare). 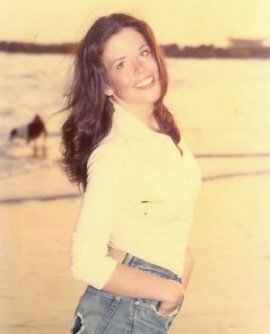 Born in Monmouth Beach and educated in local Catholic primary and high schools (Star of the Sea and RBC), Alice was a person of great intensity and beauty. Today, many men — accomplished and confident guys — who grew up with her tell me how swayed (and sometimes intimidated) they were by her dazzling persona. Etched into my memory forever is the evening my father answered a phone call and learned of the death of his second-born daughter. Being just a boy of 14 when Alice died, my memories of her are still fond. A young woman of great inner and outer splendor, Alice was an accomplished 21-year-old registered nurse when she died in an auto accident during the Thanksgiving weekend of 1974. A year before, she had graduated at the top of her class from St. Clare’s Hospital School of Nursing in New York City. The commencement exercises, which I attended, were held in the magnificent St. Patrick’s Cathedral in Manhattan. “She decided all on her own to go into nursing and she did it all on her own without any help from me,” my physician-dad told me. “I was very proud of her work and I know she was too.” Never afraid to jump into action, Alice worked in the intensive care unit at my dad’s hospital — the very busy Riverview Hospital in Red Bank. There she quickly won the respect of her nurse colleagues and the staff physicians. In receiving a thoroughly Catholic education (1st grade right through nursing school), Alice came to embody its teachings — hope, compassion, love, faith. One of her colleagues in the ICU said that Alice was “very dedicated but also had a sense of what she was doing within a greater scope. She didn’t want to say in nursing permanently.” So perhaps my father was right about her career arch in medicine. I would have loved to see it all. Alice Kelly — Hollywood gorgeous! The ancient Greeks — who knew a thing or two about life — believed that, “Out of tragedy comes wisdom.” As painful as it is for me to admit, I must agree with their reasoning. Thus, while Alice may be gone, I know that her noble ways live on in all those she touched. The love and admiration you have for your sister is beautiful. I met Alice our first day of nursing school (which I believe was her 18th birthday) and we “clicked” immediately. We became inseparable — she was truly one of the best friends I ever had. And boy did she love her family, Alice spoke of her parents and all her siblings with so much love and pride. Such a beautiful, happy young girl. I think of Alice very often (in fact I was just speaking of her today with a fellow St. Clare graduate). I miss her so much but I am so happy I knew this absolutely amazing, kind, wonderful sense of humor human being.